From the team who bought us the cooler-than-thou Mrs Pound comes Foxglove, a 1950s-style watering hole serving up classic cocktails on Duddell Street. If you know the story behind Mrs Pound, you’ll soon notice there’s a pattern emerging in the quirky little yarns spun to accompany the team’s themed establishments. 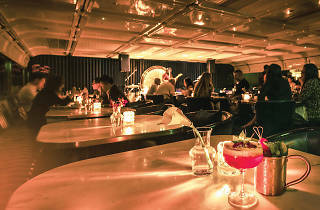 Here, the bar is supposedly ‘inspired by the globe-trotting adventures of an English gentleman’ (the enigmatic Frank). Upon entering, we’re transported back to the fabulous 50s with an interior reminiscent of the luxurious first class aeroplane cabins of that era. We almost expect there to be curls of cigarette smoke in the air and Don Draper-esque executives flirting with flight attendants. 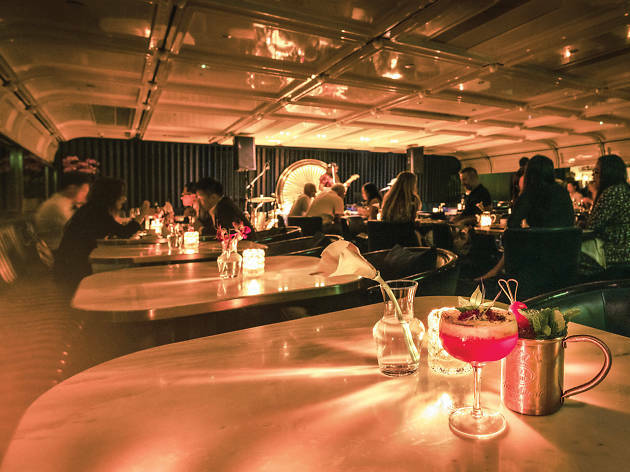 Though none of these things are actually happening, thanks to the interior details, we quickly conclude Foxglove successfully nails the theme as well as the atmosphere. Foxglove is still finding its feet when we visit, but it manages to execute the 1950s theme competently and without falling foul of prioritising concept over quality. With a few tweaks, it has the potential to earn the same hipster credentials that big sister Mrs Pound already possesses. Mon-Thu 12pm-3pm, 5pm-1am; Fri 12pm-3.30pm, 5pm-3am; Sat 5pm-3am; Sun closed.